2010. By Bill Gove. A great logging railroad history by the well-known Vermont author. Book chronicles the colorful and often perilous history of the various logging rail lines that once operated in New Hampshire's rugged North Country. 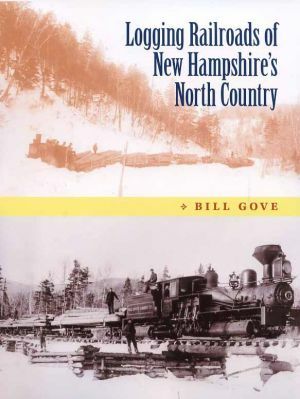 Based on nearly four decades of research, the book includes chapters on the Wild River Railroad, the Kilkenny Lumber Company Railroad, the John's River Railroad, the Upper Ammonoosuc Railroad, and the Success Pond Railroad, among others. Gove's lively account is also complemented by more than 150 vintage images and a dozen original maps and charts drawn and compiled by the author. Softcover. 168 pp.